Doxorubicin (Adriamycin, ADM) is an antimitotic drug used in the treatment of a wide range of malignant tumors, including acute leukemia, lymphoma, osteosarcoma, breast cancer, and lung cancer. Multidrug resistance-associated proteins (MRPs) are members of a superfamily of ATP-binding cassette (ABC) transporters, which can transport various molecules across extra- and intra-cellular membranes. The aim of this study was to investigate whether there was a correlation between MRP4 and primary ADM resistance in osteosarcoma cells. In this paper, we chose the human osteosarcoma cell line MG63, ADM resistant cell line MG63/DOX, and the patient's primary cell GSF-0686. We checked the ADM sensitivity and cytotoxicity of all the three cells by cell proliferation assay. The intracellular drug concentrations were measured by using LC-MS/MS. We also examined MRP4 gene expression by RT-PCR and Western Blot. We found that the intracellular ADM concentration of the parent osteosarcoma cell line MG63 was higher than the ADM resistant osteosarcoma MG63/DOX cell line or the GSF-0686 cell after ADM treatment (P < 0.05). In addition, MRP4 mRNA and protein levels in ADM resistant osteosarcoma cells were higher than in MG63 cell (P < 0.05). Taking together, this work suggests that overexpression of MRP4 may confer ADM resistance in osteosarcoma cells. The existence of osteosarcoma can be traced back to over 5000 years ago to mummified corpses from ancient Egypt. Osteosarcoma is the most common primary malignant bone tumor occurring in children and adolescents between the ages of 10 and 20. Osteosarcomas account for about 60% of bone cancers in patients younger than 20 years old. Osteosarcoma also exist in elderly patients. Great advances have been made in the treatment of osteosarcoma during the past several decades, including multi-agent chemotherapy that is given before and after surgery. However, there are two major problems that affect the treatment of osteosarcoma: The distant metastasis and multidrug resistance (MDR). Multidrug resistance in cancer is the principle mechanism by which cancer cells develop resistance not only to single cytotoxic drugs, but to a whole range of drugs with different structures and cellular targets. One of the mechanisms of drug resistance is the overexpression of MDR proteins. MDR proteins can work as a molecular pump, decreasing the intracellular drug concentration. P-glycoprotein (P-gp) is the first reported MDR protein (MDR1), which is encoded by the ATP-binding cassette sub-family B member 1 (ABCB1) gene. ,[ 4] It has previously been shown that MDR1 suppress caspase-3 and caspase-8 activities, inhibiting cell apoptosis induced by anti-tumor drugs. In addition to P-gp, other multidrug resistance-associated proteins (MRPs)  and breast cancer resistance protein (BCRP) have been discovered, and all of these proteins belong to ATP-binding cassette (ABC) transporter proteins. MRP4/ABCC4 is expressed in many tissues and cells, including ovary, testis, kidney, lung, intestine, liver, brain, pancreas, prostate (highly), and various of blood cells (lowly). ,[ 14],[ 19] MRP4 was first described in 1999 in a human T-lymphoid cell line, in which overexpression of MRP4 was directly linked to impaired antiviral efficacy and enhanced efflux of antiviral nucleoside based drugs  . Markos proved that the MRP4 deficient mice could enhance accumulation of the anticancer agent topotecan in specific tissues  , while MRP4 was overexpressed in the topotecan resistant cells. Further studies showed that MRP4-overexpressing cells could become resistant to anticancer agents. MRP4 is known to transport a diverse array of compounds, ,[ 21],[ 22] including pravastatin, tetracycline, beta-lactamsa, fluoroquinolonesa, adefovir, ganciclovir, zidovudine (AZT), cladribine, methotrexate, irinotecan, topotecan, gimatecan, mefloquine, and cetirizine. MRP4 also has the outstanding ability to transport nucleotides and nucleotide analogs. A series of cancer cell lines have been used to study doxorubicin resistance. However, there is no data regarding osteosarcoma cells. This paper investigates the pharmacological role of MRP4 in osteosarcoma cells and provides insights into putative pathophysiological function in signaling processes as a potential new target for drug development. In our preliminary clinical trails, we found a osteosarcoma patient, who was diagnosed primary ADM drug resistant. In addition, our hospital had the human osteosarcoma cell line MG63 and ADM resistant cell line MG63/DOX. So we used the patient›s primary cell GSF-0686 to identify the relation between the MRP gene expression and the osteosarcoma ADM resistance. Doxorubicin (ADM) was obtained from Pfizer Pharma (New York, USA). It was dissolved with normal saline to make a 1000x peak plasma concentration (PPC) stock solution at 1μg/ml. Cell Counting Kit-8 (CCK-8) was purchased from Dojindo Laboratories (Kumamoto, Japan). The Human osteosarcoma cell line MG63 and MG63/DOX were obtained from Shanghai Jiaotong University Affiliated Sixth People's Hospital, Shanghai of China. The human MDR osteosarcoma cell line MG63/DOX, in which P-glycoprotein (P-gp) was overexpressed, was selected in a step-wise manner by exposing drug-sensitive MG63 cells to increasing doses of ADM. The cells were cultured in Dulbecco's Modified Eagle's Medium (DMEM; Hyclone, UT, USA) supplemented with 10% heat-inactivated fetal calf serum (FCS; Si Ji Qing, Hangzhou, China), 100 units/mL penicillin and 100 mg/mL streptomycin (Gibco, NY, USA) in a humidified atmosphere at 37°C with 5% CO 2 . The primary cell GSF-0686 was obtained from the osteosarcoma tissue of a patient who had multi-drug resistance. The tissue was cut into 2-4 millimeter pieces and incubated with 0.5% trypsin at 37°C for 20 minutes. The cells were gently dispersed by pipetting, and then filtered through fine mesh. After centrifugation, the cells were resuspended and seeded into tissue culture dishes in DMEM containing 10% fetal bovine serum (FBS). Cells were seeded into 24-well plates, where each treatment group was plated in replicates of three. The cell number was checked from day one through day seven. The doubling time was calculated using the Patterson formula: Td = Tln2/ln (N T /N O ), where Td is defined as doubling time (h); T is defined as the time taken for the numbers of cells growing from N O to N T , and N is cell number. The effects of ADM to the proliferation of MG63, MG63/DOX, and GSF-0686 cells were measured using the Cell Counting Kit-8 (CCK-8). Briefly, the cells were seeded into a 96-well plate at 5 × 10 4 cells/ml (100 μl). After a 24 hour incubation with fresh medium, 10 μl of the various chemical dilutions at the indicated concentrations of ADM was added to the plates, and the cells were incubated for an additional 24, 48, and 72 hours. At the end of drug treatment, 10 μl of CCK-8 was added to each well, and the cells were incubated for 4 hours at 37 0 C. Absorbance (A) was analyzed using Multiskan MK3 microplate reader (Thermo Labsystems, Beverly, MA, USA) at 450 nm. The half maximal inhibitory concentration (IC50) and 30% inhibitory concentration (IC30) were calculated. The resistance factor of multidrug-resistant cell line MG63/DOX for a particular drug is defined as the ratio of IC50 of MG63/DOX cell to IC50 of MG63 cell. ADM treated MG63, MG63/DOX, and GSF-0686 cells were collected at different time points. The cell lysates and the cell culture media were subjected to LC-MS/MS analysis. Non-treated cells were used as control. The conditions of liquid chromatography were as follows: Zorbax XDB-C18 column (2.1 mm × 150 mm i.d., 3.5 μm) (Agilent Co., MA, USA), the mobile phase A (0.1% formic acid, contained 5 mM Ammonium formate) and the mobile phase B (acetonitrile, flow rate was 1.0 ml/min, 35). The positive electrospray ionization (ESI) was performed under ion multiple reaction monitored (MRM) mode. The precursor-to-product ion transitions of m/z 544.2 → 397.2 and m/z 528.2 → 321.3 were used to measure and quantify ADM. 1 mg/ml ADM was used as standard, while 100 μg/ml daunorubicin (DNR) as internal control. Total RNA of cells was isolated using the RNeasy Mini Kit (Qiagen, Germany), and 2 μg of RNA was subjected to reverse transcription-PCR with M-MLV Reverse Transcriptase (Promega, USA). Real time-PCR amplification mixtures (20 μl) contained 150 ng template cDNA, 2x SYBR Green I Master Mix buffer (10 μl) (Applied Biosystems, USA), and 200 nM forward and reverse primers. Reactions were run on a Sequence Detection System (ABI Prism 7900HT, Applied Biosystems, USA). The ABCC4 forward primer was: 5'-GTT CTT CTG GTG GCT CAA TCC-3', reverse primer was: 5'- GGC TTC TGT GCG TCA TTC TC-3'; the β-actin forward primer was: 5'- GTG GAC ATC CGC AAA GAC-3', reverse primer was: 5'-AAA GGG TGT AAC GCA ACT A-3'. The specificity and quantity were validated via melting curve analysis. Relative expression levels of ABCC4 gene were normalized to β-actin. The statistical analyses were assessed using the unpaired one-tailed Student's t-tests. All comparisons were considered significant at P <0.05. Total cell proteins were extracted using a Total Protein Extraction Kit (Applygen Technologies Inc., China) according to the manufacturer's instructions. Protein was quantified using the BCA Assay Kit (Beyotime, China). Protein samples were separated by electrophoresis on 10% SDS/PAGE gels and transferred to polyvinyl difluoride (PVDF) membranes (Thermo, USA). Antibodies were used as indicated by the manufacturer: anti-MRP4 (Abcam, USA), anti-β-actin (Beijing CoWin Biotech Co., Ltd., China). To investigate the cell proliferation of several human osteosarcoma cell lines, viable cells were counted at the indicated days. Compared to the non-resistant MG63 cell line, the drug-resistant cell line MG63/DOX has a reduced growth rate and a smaller slope, while the primary GSF-0686 cell line has a minimum growth rate and the smallest slope [Figure 1]. The doubling times of MG63/DOX (46.9 hours) and GSF-0686 (61.3 hours) are significantly different from that of MG63 (38.0 hours) (P < 0.05). 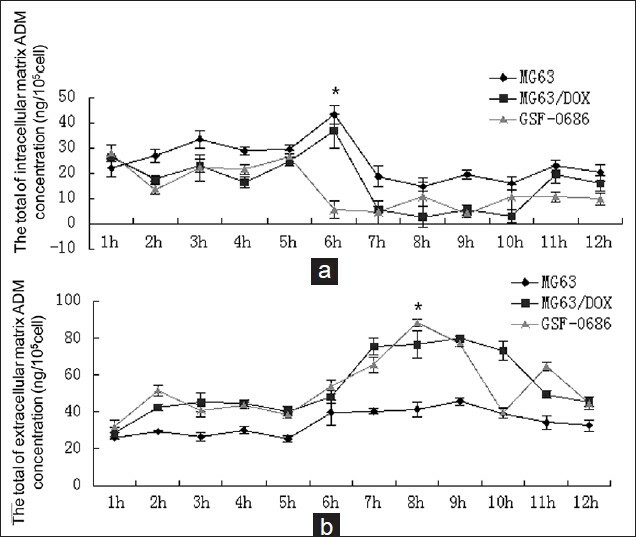 The CCK-8 assay shows that the IC 50 of ADM in MG63, MG63/DOX, and GSF-0686 is 0.004 mM, 0.025 mM, and 1.5 mM, respectively, when treated with ADM for 72 hours [Figure 2]. The IC 30 of ADM is less than 10 times of its peak plasma drug concentration (PPC) in MG63 cell, indicating that MG63 is drug sensitive. Moreover, the IC 30 of ADM in MG63/DOX and GSF-0686 cells are more than 10 times of PPC, suggesting that they are drug resistant. ADM has inhibitory effects in the osteosarcoma cell MG63, the multidrug-resistant cell line MG63/DOX and the primary drug-resistant cell line GSF-0686, but has lesser effects in MG63/DOX and GSF-0686 cells. LC-MS/MS revealed that when incubated with 50 ng/ml ADM for 6 hours, the drug concentration inside MG63 cells was significantly higher than in MG63/DOX cells (1.7 ± 1.1 times) and GSF-0686 cells (8 ± 0.9 times) (P < 0.05) [Figure 3]a. 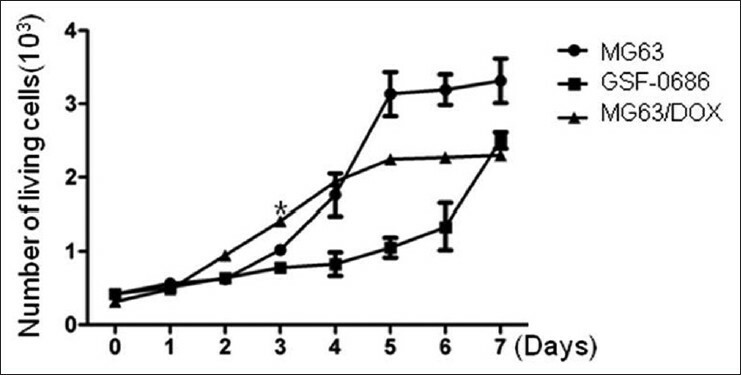 Meanwhile, the extracellular concentration of ADM at 8 hours was 1.8 ± 0.7 times higher in MG63/DOX cells, and 2.1 ± 0.5 times higher in GSF-0686 cells when compared with that in MG63 cells [Figure 3]b. When these three cell lines were treated with the same concentration of ADM, the intracellular concentration of ADM in the drug resistant MG63/DOX and GSF-0686 cells was lower than in MG63 cells, while the extracellular concentration in the drug-resistant cells was higher than in MG63 cells. This suggests that ADM is pumped out of the drug-resistant cells and may explain why they fail in osteosarcoma chemotherapy. We performed Q-PCR in MG63, MG63/DOX, and GSF-0686 cells to detect the expression level of ABCC4 mRNA. The results were normalized to the expression of β-actin. Compared to the expression of ABCC4 in MG63 cells (100%), the expression of ABCC4 in GSF-0686 and MG63/DOX cells were 129% and 119%, respectively [Figure 4]a. In other words, the expression levels of ABCC4 in those three cell lines were: GSF-0686 > MG63/DOX > MG63. Western blotting showed that the expression of the ABCC4 protein in these cell lines was consistent with the expression of ABCC4 mRNA [Figure 4]. We found that the efficiency of ADM uptake was the highest when cells were incubated for 10 minutes. In order to detect the expression level of ABCC4 mRNA in both osteosarcoma and drug-resistant cells, we treated MG63, MG63/DOX, and GSF-0686 cells with indicated concentration of ADM for 10 min, respectively, harvested all the cells and performed Q-PCR. The results were compared to the expression of ABCC4 of untreated MG63 cells, and normalized to the expression levels of β-actin. The expression of ABCC4 was the lowest when treated with 10μM ADM, which indicated that this dose was least likely to induce drug resistance [Figure 5]a. We treated MG63, MG63/DOX, and GSF-0686 cells with 10 μM ADM, and harvested the cells at the indicated time points, to detect the expression of ABCC4. When treated with the same concentration of drug, the expression of ABCC4 in both cell lines underwent a down-regulation first, and then peaked at 2-hour treatment [Figure 5]b. 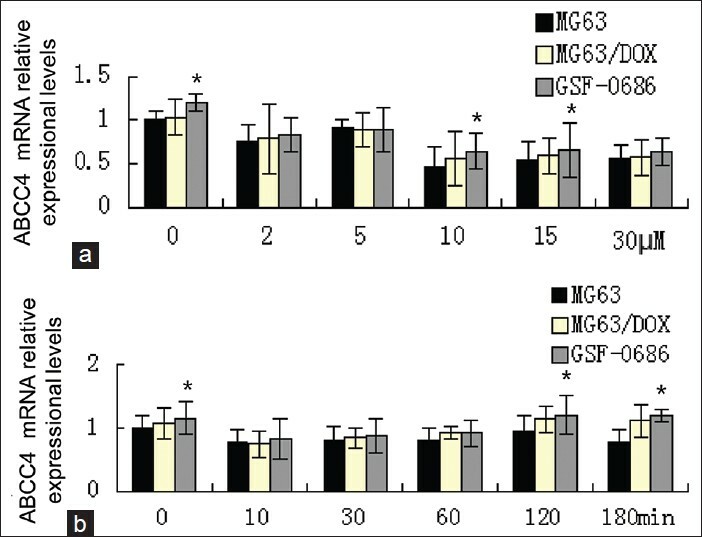 However, when compared to control group, GSF-0686 cells had a much higher peak than the control (121:96), whereas MG63 cells showed no significant difference. Whether exposed to the concentration gradient or to the same concentration, the expression of ABCC4 in MG63, MG63/DOX, and GSF-0686 cells increased first and then decreased. In addition, the expression of ABCC4 in GSF-0686 cells was higher than in MG63 cells at the most of time points. At the lower concentrations (2 μM and 5 μM), there was no significant difference of ABCC4 expression between these two cell lines. However, at higher concentrations (10 μM, 15 μM, and 30 μM), the expression of ABCC4 in GSF-0686 cells was higher than in MG63 cells. The occurrence of resistance against cytotoxic agents is a major problem in cancer chemotherapy. Various pathological types of osteosarcomas have different reactions to chemotherapy drug. Different chemosensitivities are even seen in patients with the same pathological tumors. In our study, we investigated ADM resistance in the osteosarcoma cell line MG63, drug-resistant cell line MG63/DOX, and primary cell GSF-0686. The overexpression of P-glycoprotein (Pgp) in tumor tissues is the main mechanism of multidrug resistance (MDR), but it is not the only mechanism. Many studies showed that MDR-associated proteins (MRPs), which are members of the ABC transporter superfamily, play important roles in cellular multidrug resistance. Like Pgp, MRP seems work as a drug pump that transport drugs from the cell. It is mainly present in the plasma membrane and is able to decrease cellular drug levels. Here, we found MG63 cells were much more sensitive to ADM than the resistant cells MG63/DOX and GSF-0686. After the same treatment of ADM, the drug resistant cells MG63/DOX and GSF-0686 have a lower intracellular drug concentration than the non-resistant MG63 cells. In other words, the extracellular drug concentration of drug resistant cells is higher than in MG63 cells. This suggests that drug-resistant proteins are involved in the transport of ADM from intracellular to extracellular, which leads to the resistance to ADM in osteosarcoma cells and may explain why they fail in osteosarcoma chemotherapy. MRP4/ABCC4 is one of the proteins that are capable of transporting a wide spectrum of organic compounds out of the cell. MRP4 has been reported to be involved in the resistance against mercaptopurines and 2-amino-6-purinethiol. ,, In vitro experiments showed that the anti-cancer drug Celebrex can induce the overexpression of the MRP4 protein in the colon cancer cell line colo-205  , resulting in drug resistance. MRP4 also affected the sensitivity of human pancreatic cancer cells to 5-fluorouracil (5-FU) and was expressed specifically in 5-FU resistant cells. We found that MRP4 was highly expressed in MG63/DOX cells when compared to MG63 cells, indicating that MRP4 plays an important role in drug resistance in osteosarcoma cells. After the same treatment with ADM, MRP4 mRNA levels first decreased and then increased in all the three cells. The change of expression is time and dose-dependent. The decrease in ABCC4 expression by ADM may induce cell apoptosis. The higher expression of ABCC4 in GSF-0686 and MG63/DOX cells than in MG63 cells suggests that drug-resistant cell lines are more resistant to cell growth. In conclusion, this study provides an analysis of ADM resistance in osteosarcoma cells, and it aids in the understanding of how MRP4 confers resistance to ADM. However, the relationship between MRP4 and ADM still needs further investigation. Chou AJ and R Gorlick, Chemotherapy resistance in osteosarcoma: Current challenges and future directions. Expert Rev Anticancer Ther 2006. 6 (7): 1075-85. Man TK, Chintagumpala M, Visvanathan J, Shen J, Perlaky L et al., Expression profiles of osteosarcoma that can predict response to chemotherapy. Cancer Res 2005. 65 (18): 8142-50. Gottesman MM and I Pastan, Biochemistry of multidrug resistance mediated by the multidrug transporter. Annu Rev Biochem 1993. 62: 385-427. Germann UA, P-glycoprotein--a mediator of multidrug resistance in tumour cells. Eur J Cancer 1996. 32A (6): 927-44. Loe DW, RG Deeley, and SP Cole, Biology of the multidrug resistance-associated protein, MRP. Eur J Cancer 1996. 32A (6): 945-57. Chanteux H, Van Bambeke F, Mingeot-Leclercq MP, Tulkens PM. Accumulation and oriented transport of ampicillin in Caco-2 cells from its pivaloyloxymethylester prodrug, pivampicillin. Antimicrob Agents Chemother 2005. 49 (4): 1279-88. Ming X and DR Thakker, Role of basolateral efflux transporter MRP4 in the intestinal absorption of the antiviral drug adefovir dipivoxil. Biochem Pharmacol 2010. 79 (3): 455-62. Eckford PD and FJ Sharom, ABC efflux pump-based resistance to chemotherapy drugs. Chem Rev 2009. 109 (7): 2989-3011. Gillet JP, T Efferth and J Remacle, Chemotherapy-induced resistance by ATP-binding cassette transporter genes. Biochim Biophys Acta 2007. 1775 (2): 237-62. Lage H, An overview of cancer multidrug resistance: a still unsolved problem. Cell Mol Life Sci 2008. 65 (20): 3145-67. Mottino AD, Hoffman T, Jennes L and Vore M, Expression and localization of multidrug resistant protein mrp2 in rat small intestine. J Pharmacol Exp Ther 2000. 293 (3): 717-23. Nies AT, König J, Cui Y, Brom M, Spring H, Keppler D, Structural requirements for the apical sorting of human multidrug resistance protein 2 (ABCC2). Eur J Biochem 2002. 269 (7): 1866-76. Nies AT, Jedlitschky G, König J, Herold-Mende C, Steiner HH et al., Expression and immunolocalization of the multidrug resistance proteins, MRP1-MRP6 (ABCC1-ABCC6), in human brain. Neuroscience 2004. 129 (2): 349-60. Rius M, Nies AT, Hummel-Eisenbeiss J, Jedlitschky G, Keppler D, Cotransport of reduced glutathione with bile salts by MRP4 (ABCC4) localized to the basolateral hepatocyte membrane. Hepatology 2003. 38 (2): 374-84. Marquez B and F Van Bambeke, ABC multidrug transporters: target for modulation of drug pharmacokinetics and drug-drug interactions. Curr Drug Targets 2011. 12 (5): 600-20. Dal Ben D, Palumbo M, Zagotto G, Capranico G, Moro S, DNA topoisomerase II structures and anthracycline activity: Insights into ternary complex formation. Curr Pharm Des 2007. 13 (27): 2766-80. Borst P and RO Elferink, Mammalian ABC transporters in health and disease. Annu Rev Biochem 2002. 71: 537-92. Haimeur A, Conseil G, Deeley RG, Cole SP, The MRP-related and BCRP/ABCG2 multidrug resistance proteins: biology, substrate specificity and regulation. Curr Drug Metab 2004. 5 (1): 21-53. Lee K, AJ Klein-Szanto and G.D Kruh, Analysis of the MRP4 drug resistance profile in transfected NIH3T3 cells. J Natl Cancer Inst 2000. 92 (23): 1934-40. Leggas M, Adachi M, Scheffer GL, Sun D, Wielinga P et al., Mrp4 confers resistance to topotecan and protects the brain from chemotherapy. Mol Cell Biol 2004. 24 (17): 7612-21. Adachi M, Sampath J, Lan LB, Sun D, Hargrove P et al., Expression of MRP4 confers resistance to ganciclovir and compromises bystander cell killing. J Biol Chem 2002. 277 (41): 38998-9004. Lai L and TM Tan, Role of glutathione in the multidrug resistance protein 4 (MRP4/ABCC4)-mediated efflux of cAMP and resistance to purine analogues. Biochem J 2002. 361: 497-503. Frederick CA, Williams LD, Ughetto G, van der Marel GA, van Boom JH et al., Structural comparison of anticancer drug-DNA complexes: Adriamycin and daunomycin. Biochemistry 1990. 29 (10): 2538-49.